The Night Bird by Brian Freeman, a Mysterious Review. 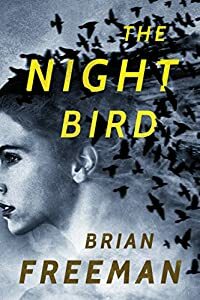 Review: Homicide Detective Frost Eastman investigates a series of inexplicable deaths that occur in San Francisco in a matter of weeks in The Night Bird, the first mystery in this series by Brian Freeman. Three women have suffered violent psychotic events that led to their deaths; Brynn, stuck in traffic by a tie-up on the San Francisco-Oakland Bay Bridge with her friend Lucy, suddenly left her car screaming, scratching her nails into her face and arms. Brynn climbed over the concrete barrier and then grabbed the steel cable trying to hold on where she fell to her death in the waters below. Lucy, looking around for help spotted a person two cars away wearing a white plastic mask with smiling red lips spread from ear to ear and evil looking eyes. When she looked again he was gone. Monica inexplicably shot herself in the head. Christie ran into the street in front of an oncoming truck and was killed immediately. Eastman, not believing in coincidences, looked for a connection in these women. His investigation led him to psychiatrist Dr. Francesca Stein, famous for helping people to erase their most terrifying memories and replacing them with pleasant dreams. There were many people who believed this was wrong and she received hate mail and phone calls because of it. It turned out all of the women who killed themselves were once her patients. As Frost and “Frankie” carried out their own investigations, the case became increasingly personal. They learned that the killer is someone who calls himself “The Night Bird”. They finally came to the conclusion that he had murdered a girl years ago. Frankie was called to testify at his trial and because of her expert opinion that he was not responsible for the murder she able to set him free. A young man, Todd, who had been a patient of Frankie’s and received her mind altering treatment, came to her and said he was being stalked by a man. He couldn’t identify him because he wore a white shiny mask with smiling red lips painted from ear to ear and big ugly mean eyes. He said he had hallucinations where he had seen the women who died, but had never known them. It wasn’t long before Frost and Frankie each started to receive text messages from “The Night Bird” warning that he will watch them die—he, too, knew their most terrifying memories. This first in series novel is a very intense, thrilling mystery. The deaths are vividly described, but not with a lot of blood and gore. Frost Eastman is a very likeable caring person with a tragic memory of his own. Although this book is a real page-turner, it is one to be read with the lights on…and not one you would want to read at bedtime. Special thanks to guest reviewer Betty of The Betz Review for contributing her review of The Night Bird. Acknowledgment: Thomas & Mercer provided a copy of The Night Bird for this review.